The Censorship here has been insane. I kept looking over the next couple of hours and found the Turkish government had videos of the guy trying to get people to oppose the Turkish leader in the last series of elections. They said without a doubt the guy was a US asset. They said they had the guy on their watch-list since 2012. This is censored in NZ. It is dangerous because Turkey is threatening NZ and the NZ people don’t know why. The Turks see clearly this is a cover-up. In the NZ Media, they censored the gunman’s travel movements. They told us where he went in Europe and for how long but left out his time in Israel where it is believed he received paramilitary training. They also left out his trip to the UK from France where he is alleged to have visited MI6 HQ before travelling to the Temple Bar district. That source is not able to be verified but they claim a photo of him exists leaving MI6 HQ. The Third largest internet router in the world is in CHCH NZ. Makes no sense to have it here, until you look across the road and understand the building opposite is a NSA/CIA data intel gathering operation plugged straight in. NZ has been a testbed for NWO operations. We have had a cashless/cash economy for 30 years with plastic cards making cash rare to see these days. They tested the Echelon program here before rolling it out elsewhere. NZ activist Nikki Hagar testified in the UK about it and wrote a book about. From the moment NZ said they were on high terror attack alert, they switched on a system which is listening to every call and tapping people’s cell phones. I believe this is how they knew who the eyewitnesses were and who to round up and threaten in the night. At least 2 other shooters were seen and at least one getaway driver (a woman). Initial reports have the police capturing these people then saying they were released because they had nothing to do with it and it was suggested they were civilians. A Sharp Shooter competition was being held that day just outside of CHCH in Melton. Those foreigners were given instant authority to help. That is not lawful or legal in NZ without Governor Generals’ say so as they are the ultimate control of NZ. Not many NZ people don’t know NZ is a registered corporation at the SEC-registered to The Queen under her official corporate titles. The nation is controlled through her representative the Governor General who has letters of patent authorizing them. This contravenes Article 4 of the United Nations, the right of a nation to self-determination. In NZ when the government creates law it is not official until signed off by the Governor General. This information was obtained 15 years ago and the MP who was asked to look into had been a career politician for 30 years and confessed he didn’t know that is how the nation ran. The manifesto is obviously bogus. In NZ and AU, you are taught English Spelling and American Spelling used to be punished by strapping. The Manifesto is full of US spelling. Once again for any NZ’er to view this is 10 years in jail. I have been pointing out to people our soldiers who fought WWII did so because the Nazi’s ethics were incompatible with our values. They fought to never be censored by their government or have Opinion Criminalized. NZ has been censored online for some years. Under the last government is was discovered NZ’ers had been censored online for 6 months before discovery and admission by the NZ govt. The Media acted as if it meant nothing. The NZ PM gets her Media Power from her PR person, who is not an NZ’er and appears to be MI6. All the international promotion of her is through him and his connections to international Media. He was also the PR person for Helen Clark, left, the previous female Labour Party leader who ruled as PM for nearly a decade. She was gifted a top job at the UN afterwards for her service to the NWO and nearly got the top job. Her task was to get Universal ID implemented by stealth in NZ via everyone’s drivers License which includes a photo of you which is used in facial recognition. GMO corn was tested in NZ. 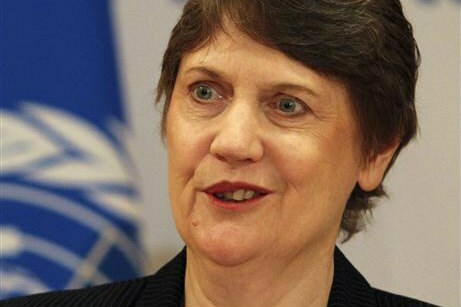 PM Helen Clark (another female Freemason, Order of The Eastern Star) approved it despite protests of the potential danger when she was the leader of NZ.